Includes starter kit and VAT. Delivery is free in Leicestershire and Rutland; please contact us for delivery costs outside these counties. The Swift Spa is the perfect option to a hard shell spa with its Rigid PE Foam (not inflatable) construction It can also be dismantled and stored or moved and re-built very easily, this also makes access to difficult sites possible being light and flat packed. The Swift Spa comes complete feel of a hard shell spa, 88 Massage Air Jets, 500 watt Turbo Air Blower and built in 2.0 kw Heater. This Hot Tub Spa comes with as high a specification as many Spas’s twice its price. 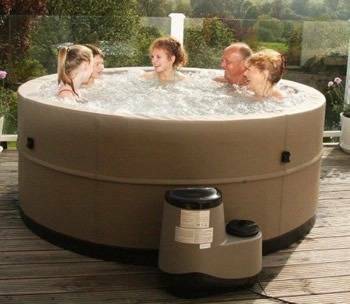 The Swift Spa is suitable for use in the garden all year round or it could be just as easily installed in a conservatory, summer house or even used whilst at your holiday home or away with your caravan. The site needs to be flat and level this can be decking slabs concrete, or any firm surface. The Swift Spa plugs into any standard 13 amp socket and comes with a fitted RCD so it really can be used anywhere. A better night’s sleep – Warm swirling water reduces stress and allows you to rest and enjoy a better night’s sleep so you wake up feeling just great. Relief from arthritis symptoms – Painful or inflamed joints cause muscles to tense in an effort to protect them. 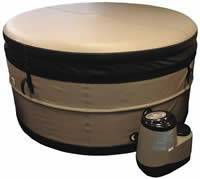 Warm water and hydrotherapy help relax the muscles and allow greater motion in the joints. Sports & Exercise injury relief – Exercising can cause microscopic tears in the muscles and lactic acid build up. The warm massaging action of a spa will accelerate the healing process. General pain relief – Endorphins are natural painkillers for the body. Warm water stimulates their release. Help for Diabetics – A group of Type 2 Diabetics were placed in a hot tub for 30 minutes a day for three consecutive weeks. The results indicated that patients reported a 13% reduction in blood sugar levels, improved sleep and an increase in their overall sense of well being. Leicester Hot Tub Hire Ltd only offers credit products from Secure Trust Bank PLC trading as V12 Retail Finance. Credit provided subject to age and status.